Back in January at CES, Huawei unwrapped two new additions to the Huawei Watch lineup: the Jewel, and the Elegant. These two watches are designed for those ladies out there who love having a beautiful watch and these definitely fit the bill. 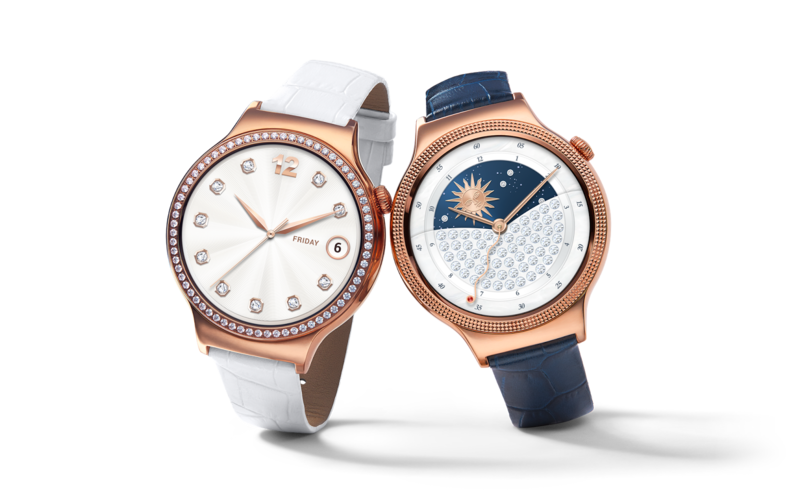 Both the Jewel and Elegant were designed in collaboration with Swarovski, with the Jewel featuring 68 crystals surrounding the bezel, and the Elegant having a knurled pattern on its bezel. Both watches feature Italian leather straps and the same 1.4″ AMOLED display that is found on all variants of the Huawei Watch. Both watches also have 10 different watch faces, allowing for the ladies to mix and match depending upon what matches their outfits. These watches popped up on Best Buy, NewEgg and B&H Video, and start at $449.99 for the Elegant, with the Jewel coming in at $549.99. Currently, Best Buy only has the Elegant on its website for $449.99 and includes free setup through its Geek Squad program. NewEgg has both versions of the watch for $449.99 and $549.99, respectively. NewEgg is also stating that the watches will be released on May 3rd, so you’ll have to pre-order them for now, or wait until tomorrow for them to be fully available. Finally, B&H Video has both versions of the watch, and some extra goodies in tow. Regardless of which version you purchase, the watches will come with a free cleaning cloth, a $50 B&H Photo & Video gift card and a Xuma 2600mAH portable power pack available in 4 different colors. Additionally, the pages for these watches on B&H show that the expected availability is not until May 20th, so you’ll have to wait a few weeks before getting your hands on the watches. Just another thing we noticed: for the men out there, Best Buy and NewEgg have the standard Huawei Watch on sale, starting as low as $249.99 from both vendors for a limited time.